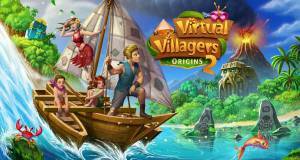 Virtual Villagers Origins 2 is a simulation point and click game that involves solving puzzles that have an underlying motive. The game is set amongst a mix of ethnic and cultural backgrounds surrounding a mythical island called Isola. After a volcanic eruption on the neighboring island of Asura, a family has made their way to Isola, seeking a new home. As their boat lands on the beach, they are greeted by a strange man and begin to explore this mysterious new world.